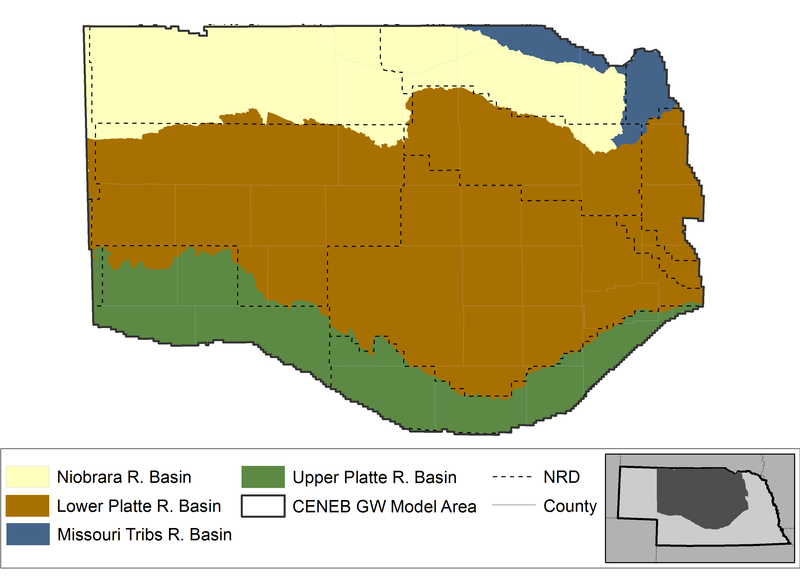 The Central Nebraska (CENEB) Model was developed as a modeling tool for simulating surface water-groundwater interactions by reproducing long-term trends under varying hydrologic and hydrogeologic conditions in the region, in support of the Department’s annual evaluation of the availability of each basin’s hydrologically connected water supplies (i.e., fully appropriated basin analysis). Model output also contributes to INSIGHT, an online portal to Nebraska water use and supply data. The CENEB Model expands upon the geographic area of a previous model, the Elkhorn-Loup Model (ELM). The ELM encompassed the entire Loup River Basin and the lands draining to the Elkhorn River above Norfolk. The CENEB Model includes the same areas as the ELM model, and adds portions of the Niobrara River Basin in north central Nebraska and the Lower Niobrara River and Ponca Creek drainages in South Dakota. CROPSIM, a water-driven, soil water-balance point model used to investigate a system’s response to different forms of vegetative growth, was used as the basis for estimating pumping and recharge inputs for the CENEB Model, effectively addressing the need to capture climate and water supply variability. The CENEB Model was developed to characterize water supplies, uses, and demands in portions of the Niobrara, Loup, and Elkhorn Basins. To address the need for information about long-term, year-to-year, and seasonal variability for the Department’s annual fully appropriated basin analysis, the CENEB model was designed to simulate the historical period from pre-1940 through 2011. Annual stress periods were used from pre-1940 through 1985; seasonal variations, using monthly stress periods, were simulated for the latter portion of the model timeline, beginning in 1986. The CENEB model incorporates a groundwater model developed using MODFLOW-NWT and CROPSIM. A surface water operations model was not included as part of this model because there are few surface water demands in this region.